Little Bee enjoys learning about all the different transportation vehicles. In fact, trucks of all kinds are his favorite toys to play with at two years of age. His all-time favorite is the garbage truck. He loves to help bring the trash to the curb and waits anxiously every Monday morning for the garbage truck to drive by. This garbage truck viewing is better than ice cream for Little Bee! 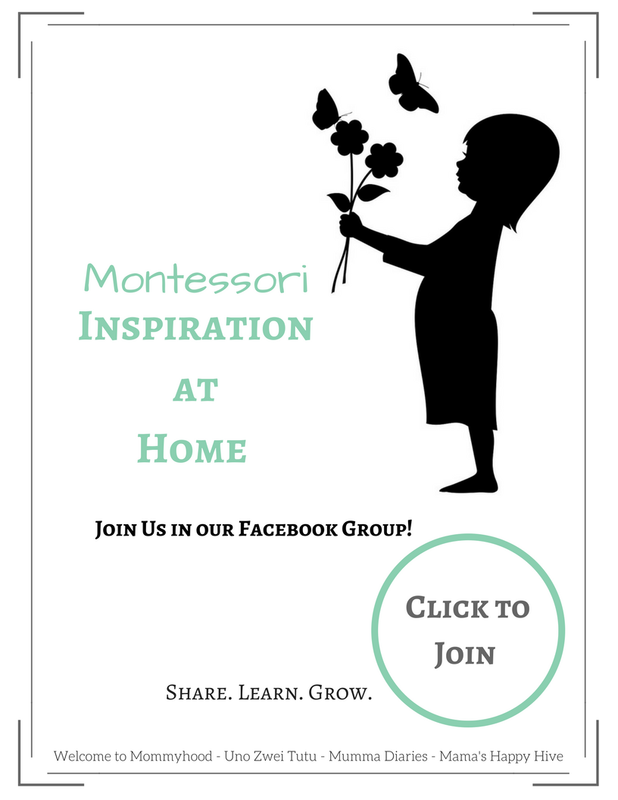 So in true Montessori style, I am following the child and putting together this Montessori inspired transportation unit for Little Bee to explore. I hope that you, my reader, are able to find inspiration in this unit for your child to enjoy. 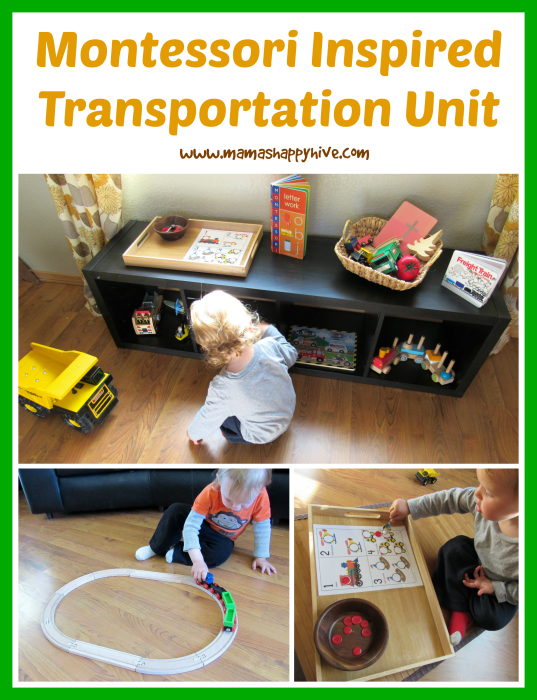 This transportation unit study has 14 tot trays to explore. *Please note that any of the small objects (rocks, buttons, pompoms) used in this post could pose a choking risk for a child. Please use parental discretion and never leave your child alone with these objects if you have any concerns. 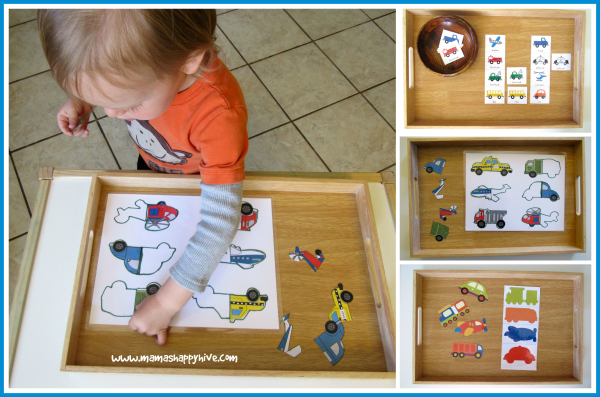 The first tot tray that I set up for Little Bee was a number counting book of vehicles. 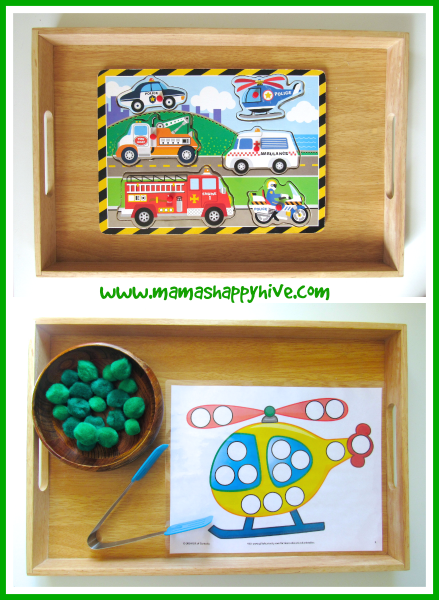 This is a great do-a-dot activity book and it is also fun to color with crayons or markers. The DIY printable book was easy to put together. I simply printed all the pages and then stapled a couple staples in the middle of the book. After that I glued several front/backs of pages together. Little Bee literally begged for this book before I was even completely done with putting it together. After the book was assembled, I sat down with him and we talked about each page in the book as Little Bee colored the vehicles. We counted the numbers and discussed the color of each vehicle. You can find your own copy of this sweet little book at: Free Numbers Book for Kids Ages 2-5 - The Measured Mom. 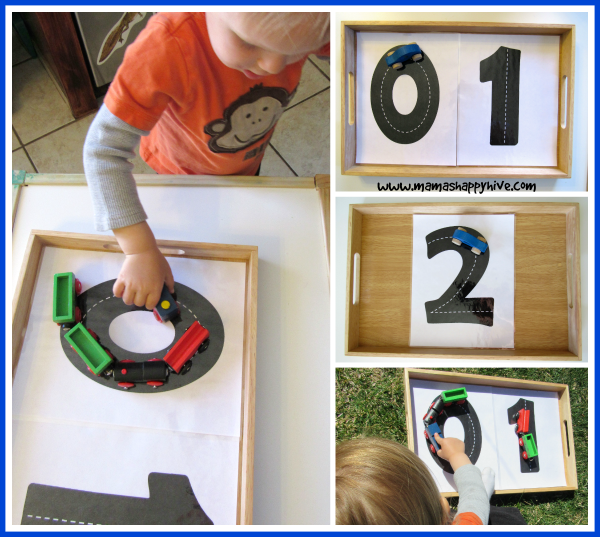 The next tot tray was a do-a-dot counting game printable from Gift of Curiosity combined with a transfer activity by spooning a button onto the correct spot on the printable. Little Bee really enjoys these transfer activities and we have done several of them over the last several months. 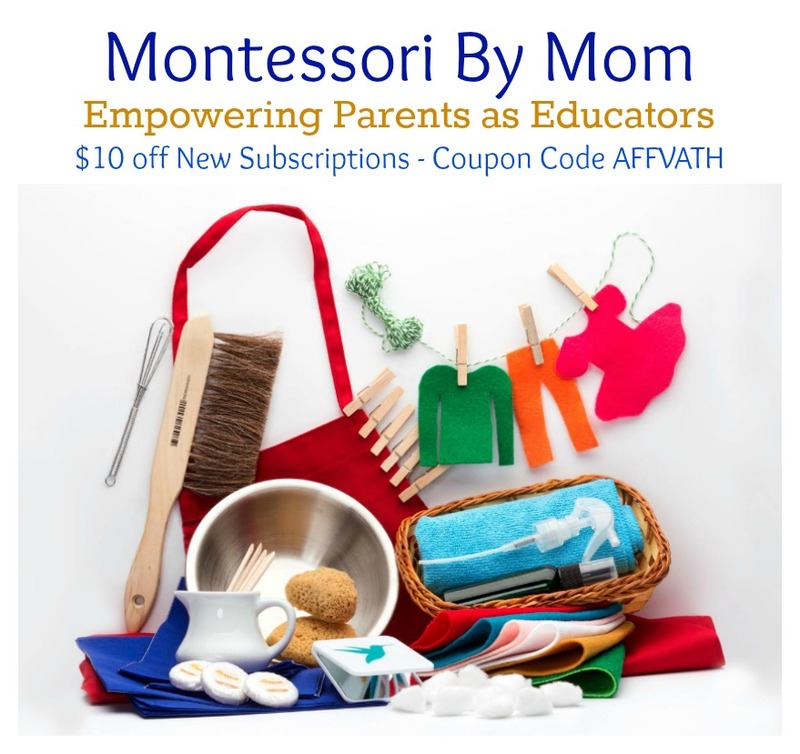 Please visit - Montessori Inspired Letter B Introduction for several more transfer activities. 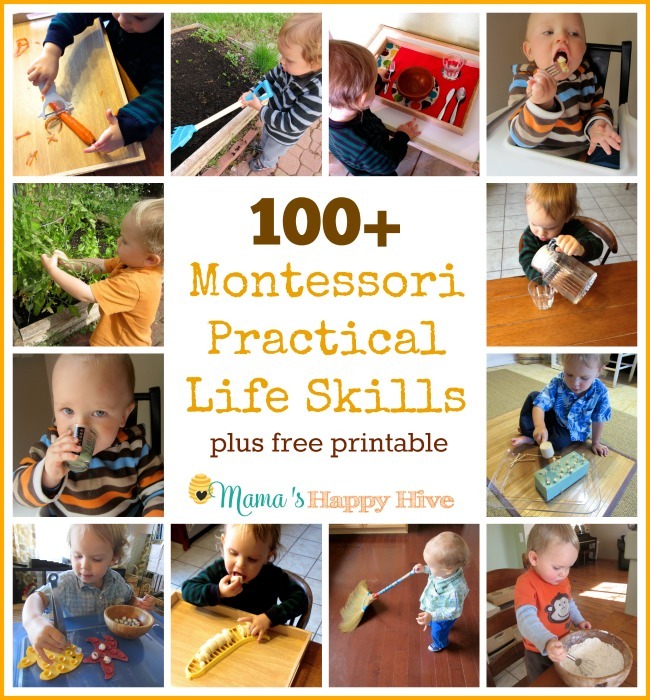 I love when Little Bee takes an activity that I have put together for him to the next level. He has been working on his fine motor skills by using tweezers for transferring objects. However, he had never transferred buttons with his tweezers before. So he decided that the spooning of buttons was boring enough and incorporated the tweezers into this activity. Then he got bored with the printable and decided to transfer the buttons with the tweezers into the back of his mini dump truck. LOL! I adore watching his toddler brain work! The following three tot trays are all matching activities that help with pre-reading skills. 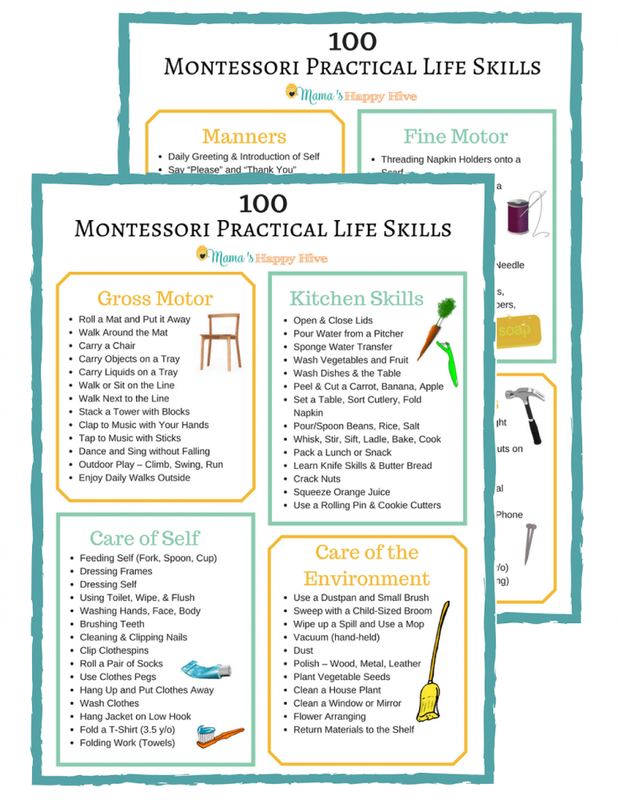 These printables were designed for a preschool-aged child, however, I adapted them to be easier for a toddler to enjoy. 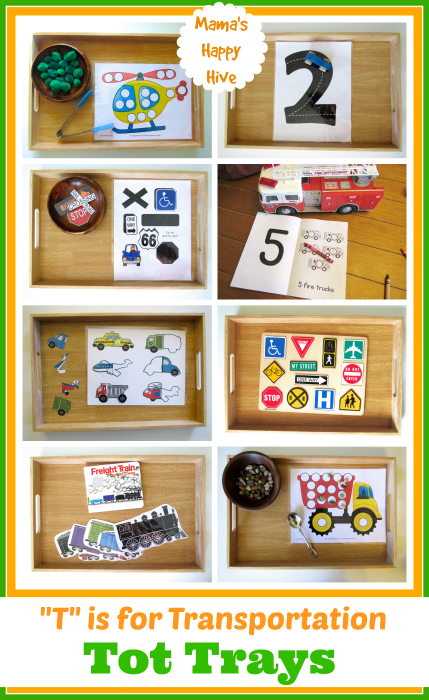 The top tray, in the photo below, is a matching game using pictures that match the same object. I left a strip of the vehicles intact as a control card and then cut the individual matching vehicles out for Little Bee to match to the control cards. The next tot tray incorporates the shapes of the vehicles and also the concept of front/back. I cut each vehicle out and then traced the outline of the vehicle onto a blank piece of paper. Next I taped one half of the vehicle onto the paper so that this would help Little Bee to easily find the other matching half. The last tot tray is a shadow match game. I simplified this printable by only using a few of the shadows and vehicles rather than the whole set of printables. 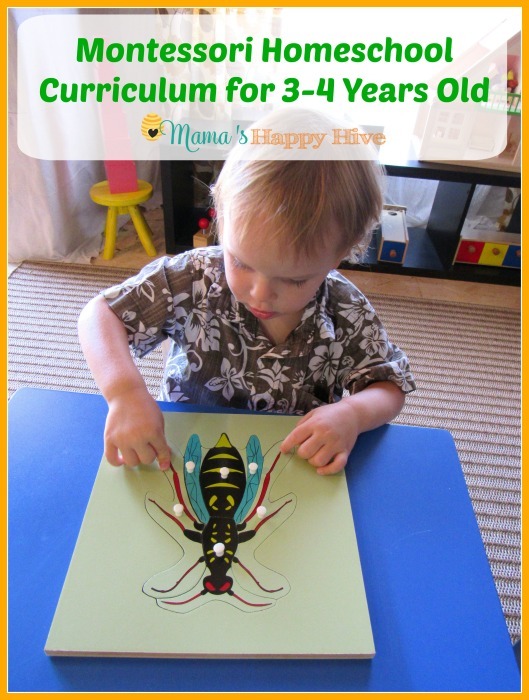 This helps Little Bee to master a few at a time before adding more complexity to this activity. Little Bee is enjoying learning about size differences and the opposites of objects. 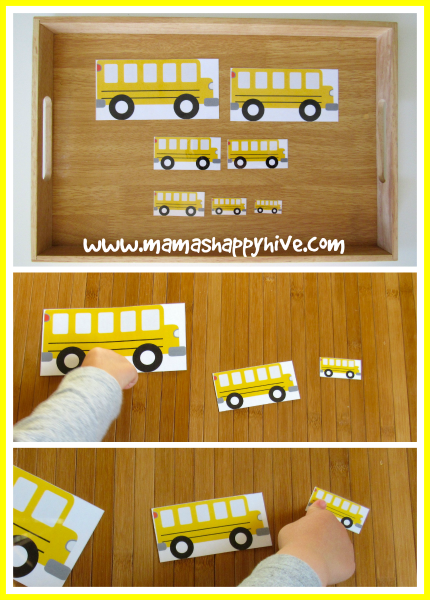 I found this great bus printable for size sequencing from Homeschool Creations. For these tot trays, I only used three of the bus print outs for Little Bee to learn the concept of large, medium, and small. I pointed to each bus while saying the words - "large, medium, and small." Then I asked Little Bee to point to the large bus, the medium bus, and the small bus. 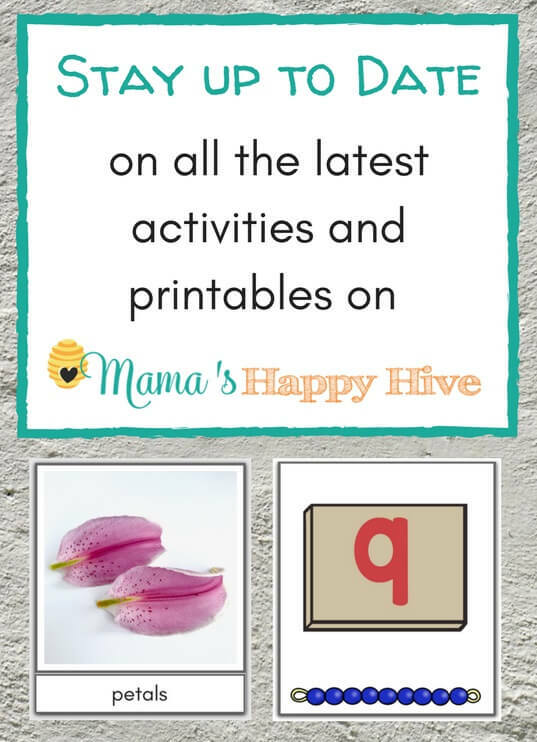 I have been introducing the letters of the alphabet to Little Bee and thought it would be fun to introduce the letter "t" with this transportation unit. 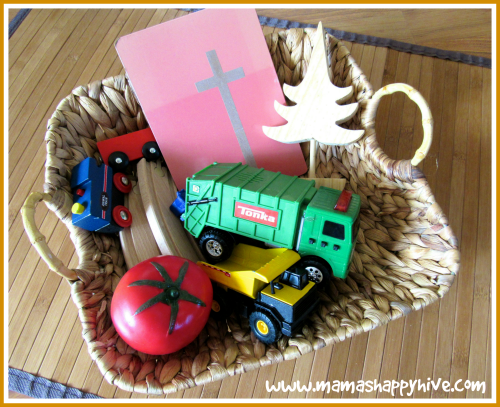 I filled up a treasure basket with objects that start with the letter "t" for Little Bee to explore. As he took each object out of the basket, I named the object while enunciating the beginning "tuh" sound. I thought a transportation unit should have an activity using traffic signs. Little Bee enjoys finding all the stop signs on our walks around the neighborhood, so this was a fun shadow matching game for him to explore. Plus, he has fun playing with the sign puzzle pictured below. 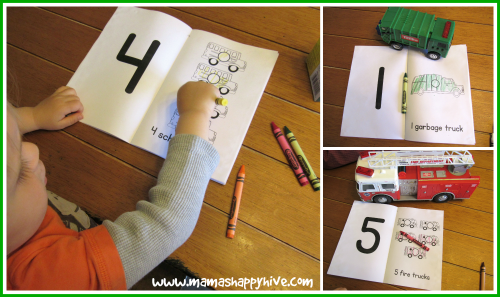 These sign activities are a fabulous way to talk about colors and shapes. The last tot tray is one more transfer activity using a spoon to transfer small rocks to a truck printable from Gift of Curiosity. Using rocks as the transfer object is a great illustration of a material that trucks actually transport from one place to the next. Little Bee had fun transferring the rocks to his truck printable and then he also transferred rocks into his toy garbage truck to haul around the house. 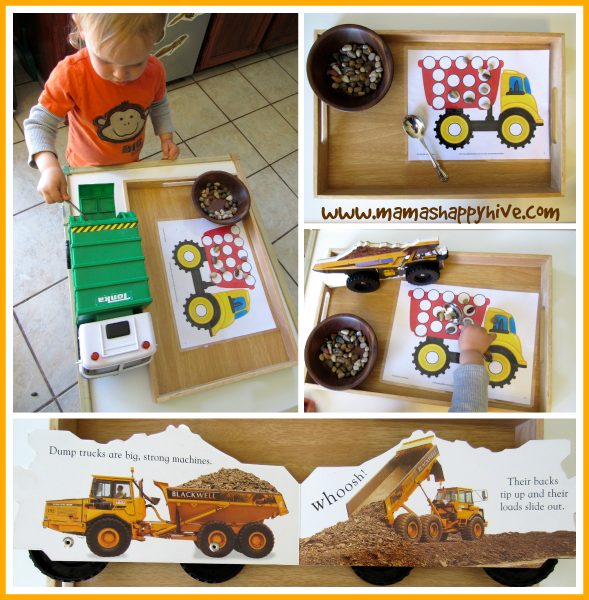 Little Bee also has a truck book that demonstrates the work that trucks do in real life. Below, you will find one more transfer activity using pompoms and tongs on a helicopter printable. 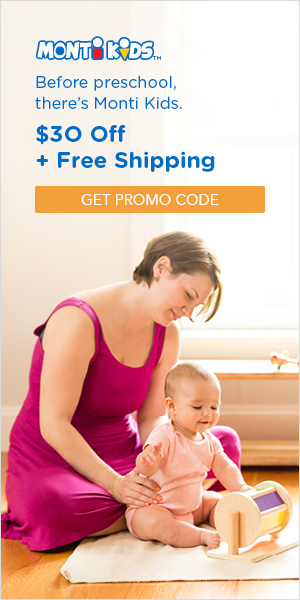 Plus, a fabulous Melissa and Doug transportation puzzle. Please share and PIN this image! Thank you! 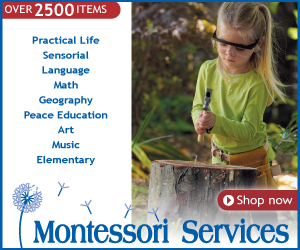 Montessori Shelves: "My Things That Go!" 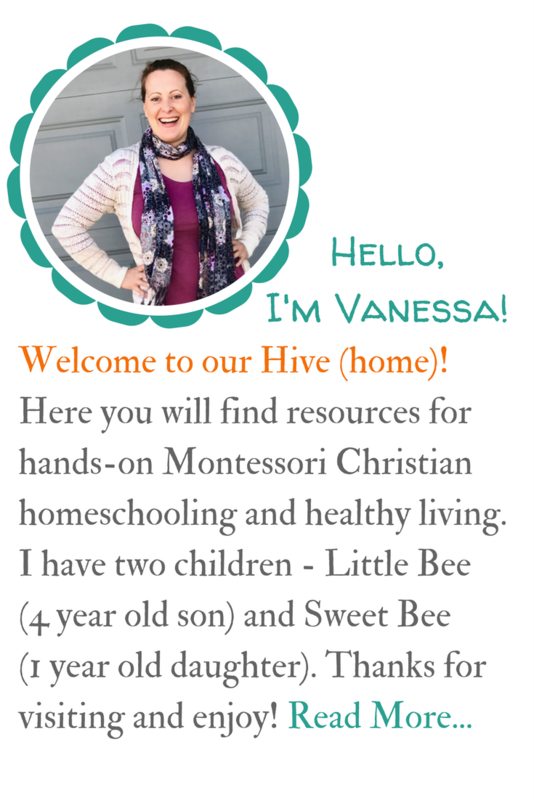 Follow Vanessa @'s board Hands-On Homeschool on Pinterest. Oh wow, these are amazing! 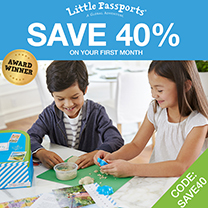 I saw a few ideas that I could incorporate with my 3 year old still, and in particular we found the Freight Train book at the library this past weekend, so thanks for the printable link and idea!! He loves freight trains, we see them often in our community 🙂 I like how you have adapted and modified the activities to make it more age appropriate for a toddler. Your son looks to be advancing pretty quickly!!! 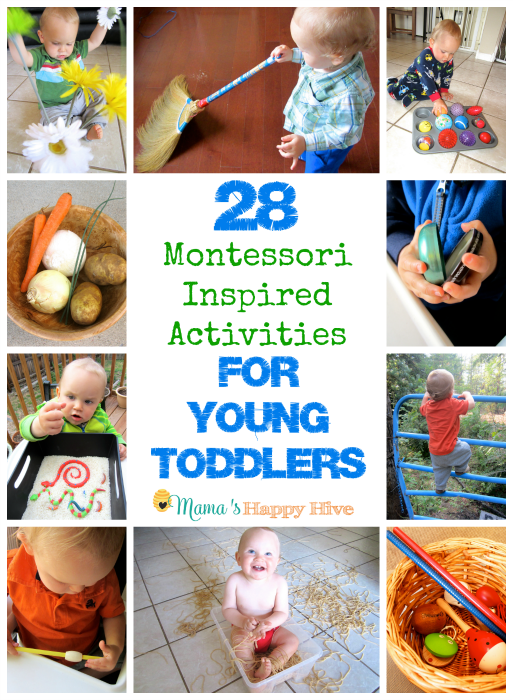 This is such an amazing collection of activities that you and Little B got up to! Thank you for sharing! I ALL the ideas! Can’t use it for now but I will definitely be back for inspiration once Vito is ready for this! Pinning and scheduled! I just LOVE this unit. The activities are amazing. The whole thing is just adorable!